All along, I've had a feeling that Jersey City's property tax apportionment would be New Jersey's most inequitable, based on the 27 year lapse since Jersey City's last reassessment and the fact that parts of Jersey City have seen a resurgence while other parts have been relatively stalled. What I didn't know until recently is that there is a statistical measure of unfairness in tax apportionment called a "Coefficient of Deviation." A General Coefficient of Deviation is a measure of variation, i.e. the average deviation of individual Assessment-Sales Ratios from the overall average Assessment-Sales Ratio of all sales in a taxing district expressed as a percent. About 25 years ago a 20 percent General Coefficient of Deviation was considered a good degree of uniformity, the current acceptable figure for Coefficients of Deviation is 15 percent, although some authorities advocate 10 percent in light of improved assessment practices and computerization. A Coefficient of Deviation greater than 15 per-cent indicates a significant lack of uniformity within a municipality and the need for revaluation. Like a Correlation Coefficient, the Coefficient of Deviation is a measure of the tightness of a cluster. The tighter the cluster, the more fair the existing property assessment is, since every's property diverges from official valuation by the same ratio. The looser the cluster, the less fair the existing property assessment is, since different property owners have properties of very different ratios from assessed value and yet all property owners pay taxes on the same outdated assessment. The Department of the Treasury's guideline is that any a town with a Coefficient of Deviation greater than 15% should reassess. 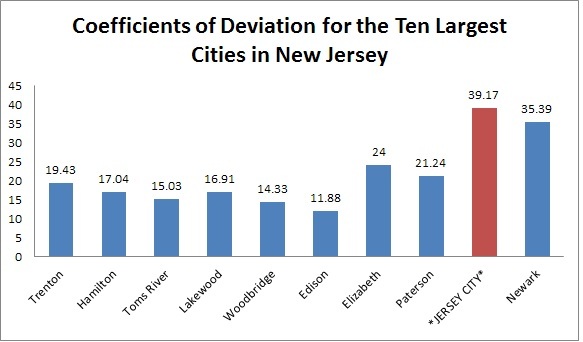 Jersey City's Coefficient of Deviation is 39%, this is the highest in the state of New Jersey, and is virtually an outlier. The town with the next most unbalanced tax assessment, Newark, has a Coefficient of Deviation of 35.39% and there is not a third New Jersey town with a Coefficient of Deviation above 30%. 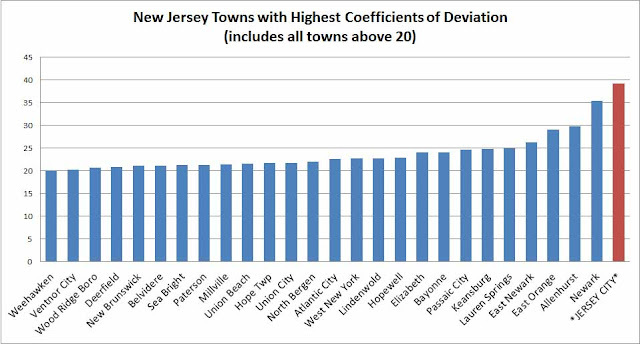 Counting Jersey City and Newark, there are only 27 towns (out of over 560) with Coefficients of Deviation above 20%. However, most of the other towns who are badly underassessed usually do not have high Coefficients of Deviation. This is because the other non-reassessing towns have seen more uniform growth, with each neighborhood essentially on the same real estate trajectory. Thus, although several other towns haven't reassessed in decades, their growth has been very uniform and very few taxpayers are being taxed unfairly. 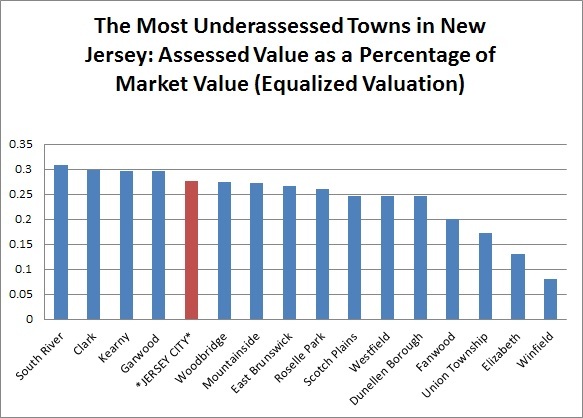 It's easy for a smaller town to have consistent and fair variations, but New Jersey's other largest cities do not show the same shockingly high variation in prices vs assessments that Jersey City has. Paterson's recent reassessment offers some hints of what is in store for Jersey City. When Paterson reassessed in 2014-15 it had not reassessed since 2007 and had a Coefficient of Deviation of 23.04. More than 11,000 Paterson homeowners are paying lower property taxes as a result of this year’s revaluation, according to a report issued this week by city officials. On the other hand, 5,500 homeowners saw their property tax bills increase because of the new assessments, the report showed. The disparities of the impact of the revaluation in some instances are substantial. For example, 152 homeowners were hit with annualized tax increases of more than $5,000, while 385 homeowners enjoyed reductions of more than $5,000, the report said. Many of the people who had the biggest increases in Paterson were people who had filed successful tax appeals. Many of the people who saw the biggest drops in their property taxes were people who had never filed tax appeals. Commercial property in Paterson ended up paying a high share of property taxes after Paterson's reassessment. It is unclear if that would apply in Jersey City as well. until I am no longer mayor." Steve Fulop justified cancelling Jersey City's reassessment this way, "I will not allow this back-door tax hike planned by the Healy administration to take place," although Fulop also accused the reassessment firm (Realty Appraisal Co. of West New York) of using backroom dealing to get the reassessment contract, even though Realty Appraisal had submitted the lowest of four bids. Steve Fulop himself lives in a house which is more under assessed than average for Jersey City and thus is likely to see a large increase in his personal taxes. $19,300 a year in in property taxes may sound like a lot, but people living in most other New Jersey towns - including most other Abbotts - would pay much more than that. Someone living in a $845,000 house in Bayonne would pay $27,000. Fulop's cancellation of Jersey City's long-planned reassessment worries me because it is part of a pattern of tax unfairness. Fulop has continued his predecessors' aggressive policy of granting PILOTs, even though PILOT residents are allowed to pay $0 to the Jersey City Public Schools. Also, if Fulop opposed reassessment because it would increase taxes for downtown and waterfront property owners, then, by the same logic, he could oppose redistributing state aid because that would mean increased taxes for aid-losing districts. 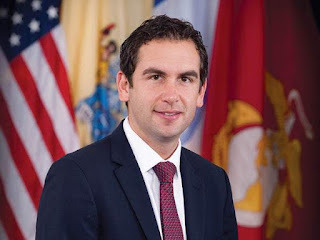 As Mayor of Jersey City, Steve Fulop is supposed to govern in the interest of the entire city, but in cancelling reassessment Fulop was governing in the interest of downtown and the waterfront. I do not think this bodes well for Fulop being a fair-minded, impartial governor. See Also "Jersey City's Property Assessment Won't Change State Aid." This is very good information. A twenty-seven year gap for a tax assessment is outrageous. I would like to see this analysis on every major city in the United States. I just sat and asked myself how many opportunities were missed by this lack of attention and if this deviation was on purpose? The deviation isn't on purpose per se, but it was a problem that Steve Fulop would have known about and yet ignored anyway. It is no secret that parts of Jersey City have gentrified more than others and that some individual properties had appreciated more than others and yet Steve Fulop wanted Jersey City's property taxes to stay frozen at the 1988 apportionment. Great post, thank you it's so informing. Are the coefficients available in Excel or only in PDF via the link provided? Unfortunately I couldn't find anything in Excel format. I had to scan all the county tables to get the coefficients.